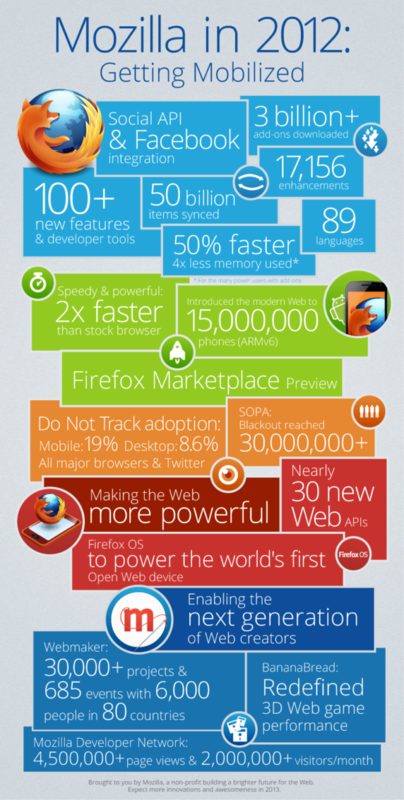 In the recent info-graphics released by Mozilla, the company boasts about the achievement it has met in year 2012. Noticeable acievements of Mozilla in 2012 were – Rebuilt Firefox for Android, 3 billion Firefox Add-on downloads, Announcement of Firefox OS for smart-phones ,Social API and Facebook Messenger integration. The info-graphics below pretty much explains the year 2012 for the company.